"Sisters of Sinai" tells an extraordinary tale of nineteenth century exploration; how two Scottish sisters made one of the most important ancient manuscript finds of the age. Hidden in a cupboard beneath the monastic library at St Catherine's in the Sinai desert the twins discovered what looked like a palimpsest: one text written over another. It was Agnes who recognized the obscured text for what it was - one of the earliest copies of the Gospels written in ancient Syriac. Once they had overcome the stubborn reluctance of Cambridge scholars to authenticate the find and had lead an expedition of quarrelsome academics back to Sinai to copy it, Agnes and Margaret - in middle years and neither with any university qualifications - embarked on a life of demanding scholarship and bold travel. In this enthralling book, Janet Soskice takes the reader on an astonishing journey from the Ayreshire of the sisters' childhood to the lost treasure trove of the Cairo genizah. We trace the footsteps of the intrepid pair as they voyage to Egypt, Sinai and beyond, Murray's guide book in hand coping with camels, unscrupulous dragomen, and unpredictable welcomes. We enter the excitement and mystery of the Gospel origins at a time when Christianity was under attack in Europe. Crucially this is the story of two remarkable women who, as widows, were undeterred in their spirit of adventure and who overcame insuperable odds to become world class scholars with a place in history. There is an obituary of Reuben J. Swanson in The Western Star here. "Canonization – a Non-Linear Process? Observing the Process of Canonization through the Christian (and Jewish) Papyri from Egypt"
Eine quantitative Analyse der christlichen und jüdischen literarischen Papyri Ägyptens aus dem zweiten bis zum fünften Jahrhundert mit dem Ziel der Untersuchung der Ausbildung des alt- und neutestamentlichen Kanons bietet gegenüber herkömmlichen Untersuchungen von Zitaten und Anspielungen in der patristischen Literatur den Vorteil eines direkteren Zugriffs auf antike Vorlieben für bestimmte Bücher. Als Resultate sind festzuhalten: Wählt man Athanasius’ Liste kanonischer Bücher, werden apokryphe Schriften im Verhältnis zu kanonischen Schriften im Laufe der Zeit immer weniger kopiert. Diese Entwicklung ist jedoch nicht linear. Im vierten Jahrhundert ist ein ansteigendes Interesse an apokryphen Büchern auszumachen (z.B. 1Enoch, Jannes und Jambres, Paulusakten), das eventuell mit der Vielfalt verschiedener christlicher Bewegungen in Ägypten (Melitianer, Arianer, Mönchtum) in Zusammenhang zu bringen ist. Die Vorwürfe verschiedener Kirchenväter, Häresie und Lektüre unkanonischer Schriften hingen zusammen, scheinen angesichts des papyrologischen Befundes nicht ganz aus der Luft gegriffen. Zumindest ist ein simultanes Ansteigen beider Phänomene auszumachen. Der Kanon, vor allem der des Alten Testaments, ist noch nicht abgeschlossen. Das Interesse an den euterokanonischen Schriften des Alten Testaments nimmt eher zu. Der Hirt des Hermas ist bis zum vierten Jahrhundert ebenso beliebt wie zentrale kanonische Bücher. On a similar subject the same author published an article in Novum Testamentum 51 (2009): "Weighing the Parts. A Papyrological Perspective on the Parting of the Ways"
A comparison of the ideological composition of the Qumran library and Christian libraries from ancient Egypt, reconstructed from pre-Constantinian papyri, reveals a profound difference in the amount of group-specific material: ca. 28% Qumran “sectarian” at Qumran vs. ca. 60% “Christian” books in ancient Egyptian Christian libraries. Even for the second century, where we have much less data, the divide is quite great. If we take Qumran as example for a Jewish sectarian library, still focused largely on the Hebrew Bible and writings shared with other Jews, Christian libraries portray an independent group-specific identity, quite early on. 2.7 WS EAN TROFOS QALPH TA hEAUTHS TEKNA. Because of the completely contaminated textual tradition of the NT, it is essential that the textual critic as a rule confines himself to the instruments of philology and exegesis, the so-called internal criteria. The customary evaluation of manuscripts and manuscript groups according to their assumed quality and value within the tradition or according to their geographical distribution on the one hand ignores the reality of the transmission, and is on the other hand not a rationally defensible procedure. In this contribution I will demonstrate the arbitrary nature of the customary approach, while showing at the same time the gains to be made for the text by applying internal criteria. Roderic L. Mullen (ed. ), The Gospel according to John in the Byzantine Tradition (Stuttgart: Deutsche Bibelgesellschaft, 2007) l + 273 pp., ISBN 9783438051325. Tobias Nicklas, "Das Christentum der Spätantike: Religion von 'Büchern', nicht (nur) von Texten Zu einem: Aspekt der 'Materialität von Kommunikation'"
The author explores the question of whether early Christianianty should properly be called a "religion of books" rather than a "religion of the (single) book." He particularly looks at the early Christian use of the codex as the preferred book form. Paola Marone, "Optatus and the African Old Latin"
This article looks at and analyzes the "African Old Latin" according to Optatus. By examining certain aspects of the quotations within the Adversus donatistas (i.e., quotations that appear in two variant forms), the author attempts to establish the context in which a revision took place. P. J. Williams, "An Evaluation of the Use of the Peshitta as a Textual Witness to Romans"
The author evaluates NA27's representation of P as a witness to the text of the New Testament. Of 150 variants for which P is cited, he discusses those 48 for which he believes the citations are questionable or wrong. I also note with satisfaction that all former volumes of the TC Journal is now back on-line after the servercrash! Some dead links still remain to be fixed. Tommaso Leoni, 'The Text of Josephus's Works: An Overview' in Journal for the Study of Judaism, 40.2 (2009), 149-184. This is a really useful survey of the manuscripts and other witnesses to the text of Josephus. A.N.S. Lane, 'B.B. Warfield and the Humanity of Scripture' Vox Evangelica 16 (1986), 77-94. Yesterday, my paper, "Text-types and the Evaluation of Readings in New Testament Textual Criticism," was accepted for the SBL Annual Meeting in New Orleans 2009, program unit New Testament Textual Criticism. This year the section invited paper proposals for two sessions citing from the "call for papers": 1) The first session will be devoted to the study and re-evaluation of textual types or text families of New Testament manuscripts. 2) For the second session, we welcome papers on all aspects of the textual transmission of the New Testament, especially those that focus on the social-history of early Christian textual transmission and the history and practice of textual criticism. Ever since the days of Westcott and Hort the concept of text-types, as part of the external evidence, has played a major role in the evaluation of individual readings and the production of critical texts. The current standard editions differ little from the text of Westcott and Hort, reflecting a preference for the text-type commonly known as “Alexandrian.” In recent years, however, the study of the relationship between manuscripts has led to refined results, most importantly through the application of the Coherence Based Genealogical Method (CBGM). This development, it is argued, leads to a “calibration” of the external evidence that is likely to diminish the importance of the concept of text-types in New Testament textual criticism. Examples from passages in the Catholic Epistles will be presented in order to demonstrate in practice how a refined knowledge of manuscript relationships beyond text-types can aid in the evaluation of readings. I have just heard, via W. Willker's Textual Criticism discussion list that Reuben J. Swanson has just passed away. Reuben J. Swanson, born 15 April 1917, was Emeritus Professor of Western Carolina University. He had his S.T.M. and Ph.D. degrees in New Testament Studies from Yale. He was professor of Biblical Studies at Grand View Seminary and Lenoir Rhyne College, where he was chairman of the Department of Religion and Philosophy, prior to his tenure at Western Caroline University. He also served on the faculties at California Lutheran University, Thousand Oaks, and St. John's Seminary at Camarillo, California. He was an ordained pastor in the Evangelical Lutheran Church in America and served congregations in Michigan, Connecticut, Iowa, North Carolina and Californa. In the area of New Testament textual criticism Swanson was known above all for his series New Testament Greek Manuscripts. Variant Readings Arranged in Horizontal Lines Against Codex Vaticanus. Here is a list of books authored by Swanson. 5071 Winton Rd Fairfield, OH 45014. We invite readers to share their memories of Reuben J. Swanson in the comment section. There is a curious case of verse number confusion in Acts 19:40 and 41. Some editions add the words 'When he had said this, he dismissed the assembly" to verse 40, others have these words as a separate verse 41. A quick check yields that NA27, Westcott-Hort, and the Vulgate (4th ed.) omit the verse while Souter, Tregelles, TR (as published by Trin.Bible.Soc. ), and, for example, the NRSV include the verse number. Does anyone have a clue where and how this difference came into being? I have the odd feeling that the shorter version is simply continuing an accidental omission of a verse number, but surely that can't be true, can it? T.J. Kraus reviews an interesting book: Markus Mülke, Der Autor und sein Text. Die Verfälschung des Originals im Urteil antiker Autoren (Untersuchungen zur antiken Literatur und Geschichte Bd. 93. Berlin/New York: Walter de Gruyter, 2007) here. Manfred Mayer (The University of Graz, Austria): "Conservationally safe digitization of manuscripts"
Scot McKendrick (The British Library, London): "The International Codex Sinaiticus Project: genesis, aims and current progress"
John Mumford (The British Library, London): "The International Codex Sinaiticus Project: condition, assessment and conservation"
Athanasios Velios and Nicholas Pickwoad (The Saint Catherine’s Monastery Library Project, Camberwell College): "The Saint Catherine’s Library Conservation Project: Collecting and managing the survey data"
For a complete list see here. For the book: Care and conservation of manuscripts 10, ed. Gillian Fellows-Jensen and Peter Springborg (Copenhagen: Museum Tusculanum Press, 2008). On a visit to Orlando, Florida, last week, I had the privilege of seeing the display of manuscripts and printed Bibles belonging to The Van Kampen Collection and housed at The Scriptorium within The Holy Land Experience. The collection is truly impressive by North American standards (not intended patronisingly!) and I was able to pick up for $2.95 the useful brochure with 23 colour photos of manuscripts and printed books entitled The Van Kampen Collection. It contains some photos not available on their website, but, alas, it lacks an ISBN and therefore may be hard to come by. Anyway, there is now a copy in Tyndale House Library. I enjoyed seeing the Mississippi Coptic Codex II of Lamentations (pictured) as well as the Yonan Codex, and a great collection of printed Bibles. Scholarly visitors should be warned that the visit to The Scriptorium is a 50 minute tour and lights and opening doors usher you from room to room on a fixed schedule. It is not therefore possible to spend the time you might wish with every artefact. However, the collection, which also houses the library of Eberhard Nestle, is apparently also available for scholarly consultation. Only two days earlier I had visited the Bible Museum at Houston Baptist University. The collection there has fewer original holdings, though it does contain some items such as 'The Wicked Bible' (the 1631 KJV without 'not' in 'thou shalt not commit adultery') of which I was told there are only 11 known extant copies. TW: Read also our earlier report on the Van Kampen collection, and the recent efforts by CSNTM to photograph it, here. Prof. Claire Clivaz informs me of a conference entitled 'Lire les papyrus du Nouveau Testament avec les autres papyrus d’Egypte'. Colloque international et école doctorale à l’Université de Lausanne, 22 au 24 octobre 09, Institut Romand des Sciences Bibliques. To select a few of the speakers: Claire Clivaz, Paul Schubert, Sylvie Honigman, Kim Haines-Eitzen, AnneMarie Luijendijk, J.K. Elliott, Tobias Nicklas, T.J. Kraus, P.M. Head. Rick Brannan reviews J. Harold Greenlee's The Text of the New Testament (Hendrickson) on his ricoblog. If Greenlee intended to write a book to make textual critics happy, to compete with standards like Metzger and Aland & Aland, then he surely failed, and Elliott’s review is spot-on. But Greenlee didn’t do that. He wrote a book for the average person, sitting in the pew, with some basic questions about the text. Greenlee paints in broad strokes and gives general answers to the questions, which is what his desired audience needs. Academics and textual critics can continue to nitpick Greenlee’s book, but don’t pay attention to them. If you need something on textual criticism for a basic layperson audience, Greenlee is your go-to book. Ryan Wettlaufer reminded me of one of the reviews included in the latest RBL newsletter. It is a review of The UBS Greek New Testament: A Reader’s Edition by Cynthia Long Westfall (McMaster Divinity College) here. The thing about these reader's editions - and there is at least one other out there published by Zondervan - is that they provide basic vocabulary on every page, but omit the critical apparatus. The vocabulary is an obvious advantage for improving one's reading skills, but the danger, I suppose, is that the usage of the critical apparatus may become more marginalized in the study of the GNT. This is of course much up to the lecturer. As a pedagogical tool, it is not meant to take the place of the UBS4 with its critical apparatus, nor does it claim to obviate the need for lexicons or other resources. I do not believe that these omissions are detrimental to the motivated intermediate reader who is building reading skills. In my experience, the ongoing critical use of apparatus and the regular study of lexicons are implemented somewhat late in the program of study by the average Greek student, except when the student is doing an exegetical assignment. However, if students are able to build reading fluency early in their study, they are more likely to build on their linguistic competency with the consistent use of critical tools. I have worn out a couple of UBS texts, so, though sympathetic, I am not impressed by the objection that a student must own two Greek Bibles if he or she uses this tool. πιστὸς ὁ θεός, δι᾽ οὑ ἐκλήθητε εἰς κοινωνίαν τοῦ υἱοῦ αὐτοῦ Ἰησοῦ Χριστοῦ τοῦ κυρίου ἡμῶν. Yesterday I came home from a sunny Scotland to a snowy Sweden, after a four-day travel to Edinburgh, as visiting Northern Scholar for 2008/2009. Larry Hurtado fetched me at the airport at my arrival on Sunday and I spent a nice evening with him and his family. I really enjoyed his company and hospitality the whole visit. I was invited to dinner every evening, one time at a nice Italian restaurant together with three of his Ph.D. students. Otherwise, I stayed at this nice guest house, Kenvie House in this room. On Monday it was time for the official guest lecture. It was a revised and longer version of the SBL paper "Earth Accuses Earth: Tracing What Jesus Wrote on the Ground". Unfortunately there was a scheduling conflict so that the church historians could not attend because of another seminar. Nevertheless, there were some twenty people gathered, including the NT lecturers Larry Hurtado, Paul Foster and Helen Bond, and many Ph.D. students. In connection with the presentation I received the special New College Tea Mug, as a fine souvenir and memory. Later on, I also received another present, the fine book on Justin Martyr and His Worlds (eds. Sara Parvis and Paul Foster). I was surprised to see so many Ph.D. students just in the NT, but, of course, these fine scholars naturally attract students from all over the world. One of Larry's students, Daniel Johansson, was even from my old hometown in Sweden. We had gone to the same school as kids (but not at the same time). Amazing! Another nice woman was from Singapore, and then a whole bunch from the US of course. I had already met one of them, the very promising Ph.D. student Dieter Roth at the SBL in Boston (who also took the two photos of me). In this article in SBL Forum, he reflects on his choice of the Ph.D. 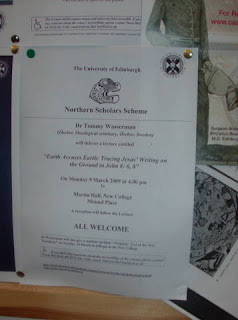 Program in Edinburgh. I am very interested in following his project on Marcion's Gospel (modeled upon Ulrich Schmid's work on Marcion und Sein Apostolos). 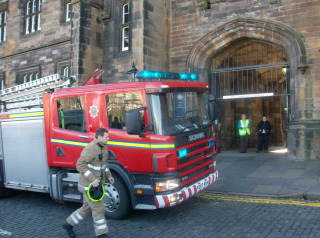 On Tuesday around 11AM I sat with some staff in their coffee room when suddenly the fire alarm went off. I asked Helen Bond, "Is that the fire alarm?" O, yes, but it is just a test," she said. There was a fire alarm test every Thursday at 11 sharp. After a little while, after someone had come in and wondered if we shouldn't evacuate, we all realized that it was Tuesday and not Thursday! So out we went, (almost) all people in the house and gathered outside on the pavement. After a while the fire brigade came. It was a false alarm, as expected. But in this way I got to see practically everyone in the whole department. The same day, at 4PM I delivered the second paper in the research seminar, a somewhat less formal context, but basically with the same audience. The topic was "Implications of Textual Criticism for Understanding the 'Original Text'." 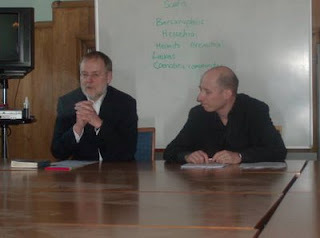 This was followed by another stimulating discussion, and I took home with me some good ideas for another project I am suppose to finish before March (on the early text of Matthew for a collected volume). On Wednesday it was time to travel home again, but I had some hours in the morning to spend in Edinburgh, so I had time to buy some presents for the family. During this long walk I passed the area where I had been three years earlier at the ISBL in Edinburgh, 2006. On the bus to the airport, some Swedish ladies happened to enter the bus just after me. Apparently they had also flewn in on Sunday on the same flight and were now heading home to Sweden too. At 10PM I finally came home, quite exhausted after hours of waiting, flying, waiting, and another bustravel. But I look back to a really nice experience, and I look forward to going to Edinburgh again in the future. We guess http://evangelicaltextualcriticism.blogspot.com/ is written by a woman (60%), however it's quite gender neutral. Rod Decker noticed that a fancy new evangelical NT text-book had a photo claiming to be P52 that was not. Nick Norelli identified it as P. Oxy 52. Just think how many mistakes were made in the process of including this in the book! There is a report that a fifth-sixth century monastery has been partially (and badly) excavated 'in the hills near Jerusalem'. An interesting mosiac was unearthed: "O Lord God of Saint Theodorus, protect Antonius and Theodosia the illustres, Theophylactus and John the priest." So here is an interesting quiz question: two of these names appear in a NT manuscript. Which names? Which manuscript? And could it have been written at this very site? Eisenbrauns Deal of the Day for Today is: The Epistle of Jude: Its text and transmission by Tommy Wasserman (Tommy would have told you himself but he is a bit shy about shameless marketing). Jesus, Judas or the Devil? Grammatically, one might understand the antecedent of εἰδὼς to be of the two figures in the prior sentence ... Judas or "the devil". The context would quickly prevail of course. However, it seems that scribes added the name Jesus, either intentionally or unintentionally making explicit what was already implicit. The Byzantine tradition and a number of later uncials read ο Ιησους. I think that the versions may have the reading for translational reasons and not because of their Greek Vorlagen. The use of ΔΕ by the Bohairic has partially persuaded me on this. The Greek loanword is frequently used to reinforce a change in verbal subject in Bohairic with no Greek attestation. Versions aside, I wonder how many of the Greek citations were actually related to one another historically. The earliest Greek texts set the stage for later variants. Certain passages would have been textual lightning rods for certain variations. Tomorrow I will fly out to Edinburgh. I have been invited to the University to hold a faculty lecture ("Northern Scholar lecture"), and I will also present a paper in a seminar. The main lecture will be a revised version of a paper that I presented at the SBL together with Jennifer Wright Knust, “Earth Accuses Earth: Tracing Jesus’ Writing on the Ground” (see report from SBL here). Earlier this week the article on the subject was accepted by Harvard Theological Review, for which we are very pleased. It will hopefully appear in a few months. We are now contacting various institutions to get permission to include some nice images. The paper for the less formal seminar will basically be on the nature of the "original text." This material will also be published later this year in Eve-Marie Becker & Anders Runesson, eds. Mark and Matthew, Texts and Contexts I: Understanding the Earliest Gospels in their First Century Contexts (WUNT; Tübingen: Mohr Siebeck). Life is full of annoying things, and for most of us it is too short to bother with Greek accents (or at least, that's what we tell ourselves). So let me confess my latest act of utter despair, I had a look at the phrase πρός σε. Σύ is one of those words that has accented and unaccented forms. In its unaccented form (only available in Gen., Dat., Acc.) σύ throws its accent back on the previous word; it is an enclitic. According to Moulton II.180 the enclitic forms of the personal pronouns ἐγώ and σύ 'are not used after prepositions, except with πρός (generally).' This is confirmed (well, repeated at least) by BDF par. 279. I searched my Bibleworks for the phrase in the NT (19 hits) and checked each of them against my trusted, printed NA27 (no differences). Here is the result: πρός σε in the first two instances (Mat 14:28, 25:39), in all remaining 17 cases both words are accented. Is there an explanation (or even a MS tradition!) or are we, in the words of the Dutch painter Karel Appel, 'just messing about'? I have had a paper accepted for the SBL International meeting in Rome for the section on Paul and Pauline letters. Here is the abstract: "Rethinking Readings in Romans (in Rome)" This paper explores the way broader narrative elements in Romans can shed fresh light on some variations in the letter. These variations are found in quotations, allusions and echoes of the Old Testament. Building on my earlier work on the text of Romans 8:28, which explores the allusion to Gen. 50:20 and argues that the Joseph story helps establish the text of Rom.8:28 and has influenced the shape of Paul's thought in Chapters 9-11 (JTS 46(1995)547-550) I consider three other textual variations in Romans. The paper will study the text of Romans 4:1 and the story of Abraham, the text of Romans 8:2 and the story of the righteous sufferer, and the text of Romans 9:28 and the story of the Righteousness of God. 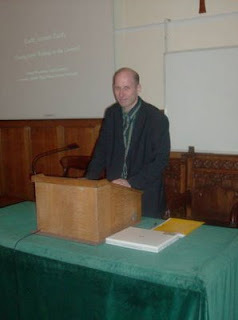 I just heard that my paper was accepted for the Sinaiticus Conference in July, so I shall be able to join the illustrious folk at the British Library, including of course the most illustrious Sinaiticus scholar of our generation, D(i)r(k) Jongkind, whose recent discoveries will be the basis of my rather exciting presentation: ‘Some Observations on Various Features of Scribe D in the New Testament’. According to the the Kurzgefasste Liste there are 30 registered MSS in the Benaki Museum in Athens. A team from CSNTM has been photographing manuscripts in this museum. Just to show that manuscripts are never safe - the six-story state archive building in Cologne collapsed yesterday taking 65,000 manuscripts with it into the dust and rubble (a bbc report or for more try here). All participants in the ESTS 2009 conference must be members of ESTS. P. Oxy. 1353 = 0206 (1 Pet 5:5-13) for Sale! In the coming weeks, we plan to email Offer Letter Instructions to those who might want to submit an offer to purchase this collection. We expect the collection to sell in a $ range of low-to-mid six figures. There is a possibility the fragments will sell separately, but we believe the collection will be worth more together. If you or an organization you are affiliated with would like the Offer Letter Instructions when we issue them, please e-mail me. SCRIPTO (Scholarly Codicological Research, Information & Palaeographical Tools) is a Postgraduate Programme at Friedrich Alexander University in Erlangen-Nuremberg supported by the Luise Prell Foundation, the Schirmer Foundation, the Bayerische Staatsbibliothek in Munich and the Herzog August Bibliothek in Wolfenbüttel, and available to graduate Medievalists and Early Modern Specialists. It offers a systematic, research-oriented introduction to the study of medieval and early modern manuscripts and to methods of describing and interpreting them. SCRIPTO is a sort of bridge between research and practical work and combines research and instruction within the framework of a uniquely innovative course, at the end of which each candidate will be awarded a certificate from Friedrich Alexander University. SCRIPTO consists of six modules that cover a broad spectrum of subjects (text typology; book illumination; palaeography; codicology; incunabula studies; informatics). There will be SCRIPTO research seminars, one of which will be given by Rosamond McKitterick (Cambridge) at Bamberg. Participants will also have the opportunity to work on a common research project. The German Manuscript Centres in Berlin, Frankfurt, Leipzig, Munich, Stuttgart and Wolfenbüttel are supportive of the SCRIPTO programme. The course will take place in cooperation with the manuscript departments of the Erlangen University Library, the Bayerische Staatsbibliothek in Munich, the City Library in Nuremberg and the Herzog August Bibliothek at Wolfenbüttel. The international academic committee of the SCRIPTO programme is made up of the following scholars: Prof. Jacques Berlioz (Ecole nationale des chartes, Paris), Prof. Guglielmo Cavallo (Università degli studi «La Sapienza», Rome), Prof. David Ganz (King’s College, London), Prof. Eef Overgauuw (Staatsbibliothek zu Berlin ? Preussischer Kulturbesitz, Representative of the German Manuscript Centres) and Prof. Ursula Rautenberg (Friedrich Alexander University, Erlangen-Nuremberg). The application deadline is 31 August 2009. The language of instruction is German. Foreign participants, however, will be able to take German language courses at Friedrich Alexander University if they so wish. They should mention this in their application. My colleague Stefan Green (exegetisk teologi) pointed me to Danny Zacharias (Deinde) who announced that a new unicode font for papyrology and textual criticism is available, IFAOGrec Unicode. There are also other versions for transliterations, and Coptic available. For description, samples and download, see here. Up to this point I have been using Gentium (for Greek) in combination with Cardo (for some special sigla), but sometimes I haven't been entirely pleased. Anyway, this new font seems very nice and should be of good benefit for papyrologists and textcritics. Comments on your experiences with fonts are welcome!